Do you want to increase efficiency, enhance connectivity and drive superior quality in your lab? Then you need to attend this year’s SmartLab Digital event. Don’t miss Unjulie Bhanot and April Pisek’s webinar on March 12 at 3pm GMT. Then you need to attend this year’s SmartLab Digital event. SmartLab Digital is an online series of live interactive webinars with hand-picked case studies by pharmaceutical industry experts and thought leaders all focused on digital excellence within the laboratory, and we are delighted to be partnering with the event again this year. Business leaders from leading life sciences and technology companies will come together to share their thoughts and experience on data integrity, AI and machine learning and the complexities of research and development. 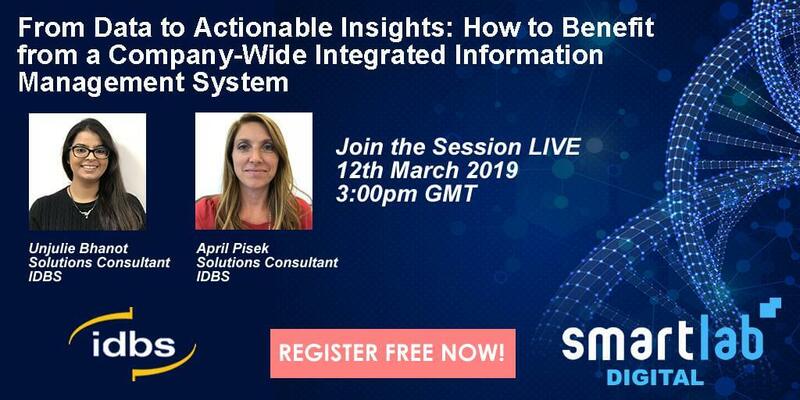 Unjulie Bhanot and April Pisek, Solutions Consultants at IDBS, will kick the event off on Tuesday, with a webinar entitled ‘From Data to Actionable Insight: How to Benefit from a Company-Wide Integrated Information Management System’. How integrated scientific data management software can solve these challenges and mitigate their impact, and key factors to consider when implementing such a solution. The first webinar of the series will focus on two rapidly growing markets: biologics development and bioanalysis, and bring forth the importance of managing Big Data and navigating its implementation in the current environment. The three-day event’s agenda is packed with speakers who will share their expert scientific knowledge with a digital spin, covering everything from advanced analytics driving ROI to empowering R&D with AI and achieving lab excellence through digital continuity. Don’t miss Unjulie Bhanot and April Pisek’s webinar on March 12 at 3pm GMT. Interested in joining us? There’s still time! Simply click here to sign up. If you would like to find out more about how implementing software can help you tackle your data management challenges, please click here.